A Wild Goose Chase Christmas is an enchanting tale that will warm your heart! I fell in love with this story on the very first page and loved it even more as I read the last words. Izzy Fontaine receives a very special gift, a Wild Goose Chase pattern quilt, from her beloved grandmother. Izzy does not understand the gift, or its value, and is surprised when Max Logan appears on her doorstep claiming ownership of the quilt. Max is a local museum curator and claims that Isabella promised him the quilt, to be used in a museum exhibit. If that isn’t strange enough, notes begin to arrive from unexpected people and places. Soon everyone is on a wild goose chase searching for the treasure that Grandma has alluded to. What they find is something they least expect but need the most! Jennifer AlLee has written an endearing story that is sure to delight readers! With a wonderful cast of characters, including Bogie, the Jack Russell Terrier, and important lessons beautifully woven throughout, A Wild Goose Chase Christmas is a story you won’t soon forget! Click to enjoy an excerpt from A Wild Goose Chase Christmas! Please read Jennifer’s delightful interview below. 1. I adore A Wild Goose Chase Christmas! What inspired this enchanting, heartwarming story? Thank you so much! There were several inspirations for this book. First, my grandmother was a professional dancer, so she was the inspiration for Grandma Isabella. The dynamic between Izzy, her mother, and her brother was inspired by my own family, even though our personalities are much different. And finally, the town of Monrovia is an actual place in Southern California that actually has a Friday night Street Fair. I’ve got lots of happy memories of it, so it seemed like the perfect place to set the story. 2. 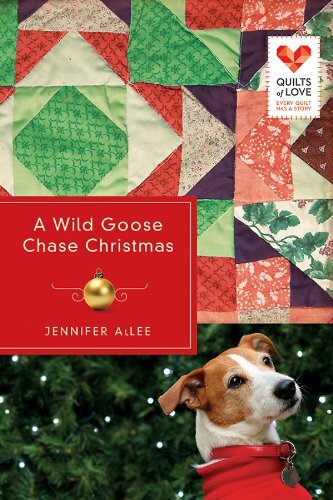 A Wild Goose Chase Christmas is part of the Quilts of Love series. Are you a quilter and/or do you have any quilts that are meaningful to you? I’m not a quilter myself, but I do have a special quilt. It’s a pattern called “Grandma’s Flower Garden” and was made by my mother. She used material from dresses and other clothing that had belonged to four generations of women in the family, from my great-grandmother to me. The quilt was a present when I went to college. 3. The quilt in this story leads to great treasure. What are some things you treasure? My greatest treasures are the people in my life, my family and friends. My son, Billy, is twenty, and he’s been my number one treasure since the day he was born. God certainly did bless me with that boy! 4. Christmas is quickly approaching! Please share with us one of your favorite Christmas memories. When I was in kindergarten, I was an angel in my school’s Christmas pageant. That’s one of my best Christmas memories, because I was so proud of my angel robe and my sparkly, gold tinsel halo! Thank you so much, Jennifer! Merry Christmas to you and your family!! Jennifer has shared a special character post, written by Izzy Fontaine. I love my family, but you know how it is. Spending time with them, especially at the holidays, can be beyond stressful. Take my mother… please! Just kidding. My mother and I have always had a bumpy relationship. For some reason, she can find fault in everything I do while my brother, Brandon, remains the golden child. But this year, Brandon’s not shining quite as bright, and Mom and I are spending way more time together than we expected to. And it’s not just family that causes stress. There’s a new man in my life, and not because I went looking for one. No, Max Logan showed up at my door looking for his grandfather, who had gone AWOL from an assisted living facility, and for the Wild Goose Chase quilt that my grandmother left to me. He’s got the crazy idea that Gran gave the quilt to his museum. I tried not to like Max at first. I told myself that he was pushy and only cared about the quilt and making it the centerpiece of his new exhibit. But he also is smart, and funny, and I can’t ignore how much he loves his grandfather. Thanks to Grandma Isabella, this could be the best – and craziest – Christmas yet. Babies have their own schedule. But so does God. 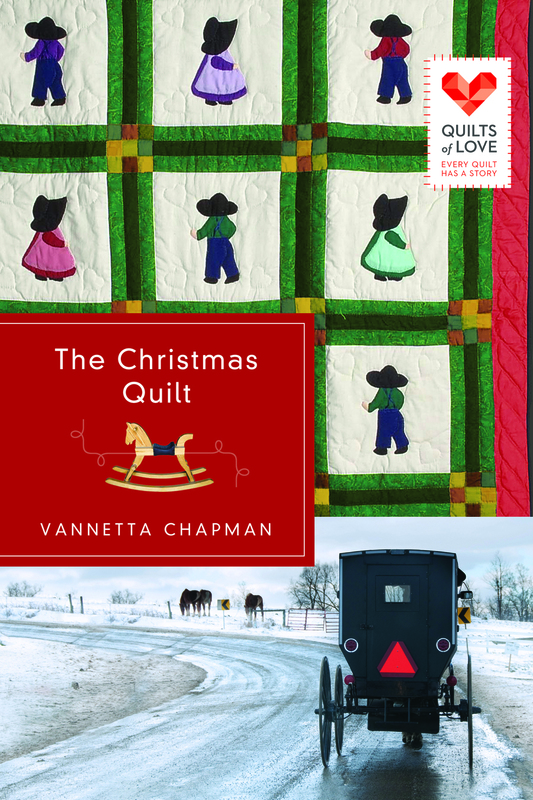 In The Christmas Quilt, we revisit the characters and community first introduced by Vannetta Chapman in A Simple Amish Christmas. I loved returning to Mifflin County, Pennsylvania and catching up with this special Amish community! Samuel and Annie Yoder continue to help the community with their medical needs. Expecting their first child, they are eager to share the experience of parenthood with Annie’s brother and sister-in-law, Adam and Leah Weaver. Leah is pregnant with twins and due to deliver before Christmas. While Annie pregnancy has been a smooth experience, Leah has experienced some emotional and physical difficulties. When Leah goes into early labor, Annie hurries to her side and convinces her that going to an Englisch hospital is best. As they wait for the arrival of the twins, Annie and Leah begin working on a nine-patch crib quilt for the babies. As they work on each square, they pray together and share stories inspired by the fruits of the Spirit. What started as way to fill the time begins to hold a far greater significance! The Christmas Quilt is a wonderful story of faith and beautifully illustrates the fruits of the Spirit. I love The Christmas Quilt and would love to visit the residents of Mifflin County again! Click to enjoy an excerpt from The Christmas Quilt. Vannetta has graciously answered a few more of my questions. Please read the interview below. 1. In The Christmas Quilt, we return to Mifflin County and catch up with Annie and Samuel and the other residents, whom we grew to know and love while reading A Simple Amish Christmas. Do you enjoy revisiting characters when you are writing? Yes, especially since there was a 3 year period between the two books. This was a wonderful chance for me to show how my characters had changed, grown closer in some instances, and encountered problems in others. Through it all, their faith is a major component. 2. I love the significance of the Christmas quilt and its squares. Are you a quilter and/or do you have any quilts that are meaningful to you? I am a beginning quilter, which means that I’m doing wall hangings and lap quilts at this point. I love doing it. On days when I finish my writing early, I reward myself with an hour of two of quilting. As far as special quilts, I have several. One is the nine patch quilt a friend made for me as I wrote The Christmas Quilt. She pieced and quilted it by hand, and I definitely treasure it. I also have quilts that were my grandmother’s and her mother’s. These are a sweet connection to our ancestors. 3. Can you share with us one of your favorite Christmas memories? My husband had a torn retina a few years ago. It required surgery, and then several days lying horizontal, and then when he was up and about still no driving. So I took him to see Christmas lights. I look at Christmas lights at the same speed I go through a museum–rather quickly. We were zip zipping around the lighted neighborhoods in our town, when Bob finally admitted he was getting dizzy. Oh we laughed about that, and I slowed down a little. But it’s a good reminder of my need to enjoy the moment a little more, especially at Christmas time. 4. What can we look forward to reading from you next? As a special treat, Vannetta has shared a character post with us. 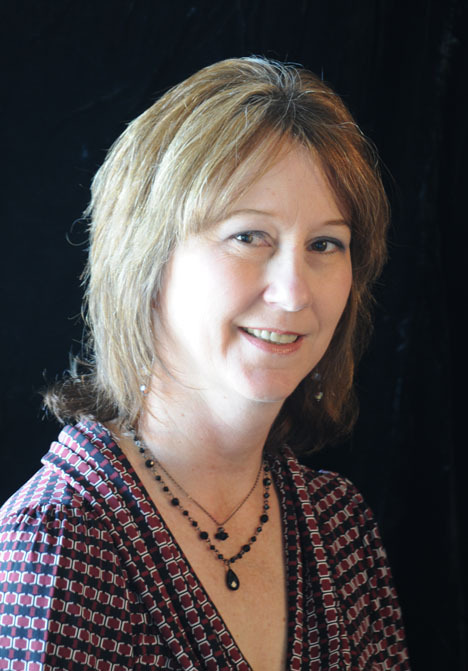 The following is an interview with Annie Weaver Yoder. 1. What is the most interesting things about you? Some might say that the most interesting thing about me is that I’m a nurse, and I’m Amish. 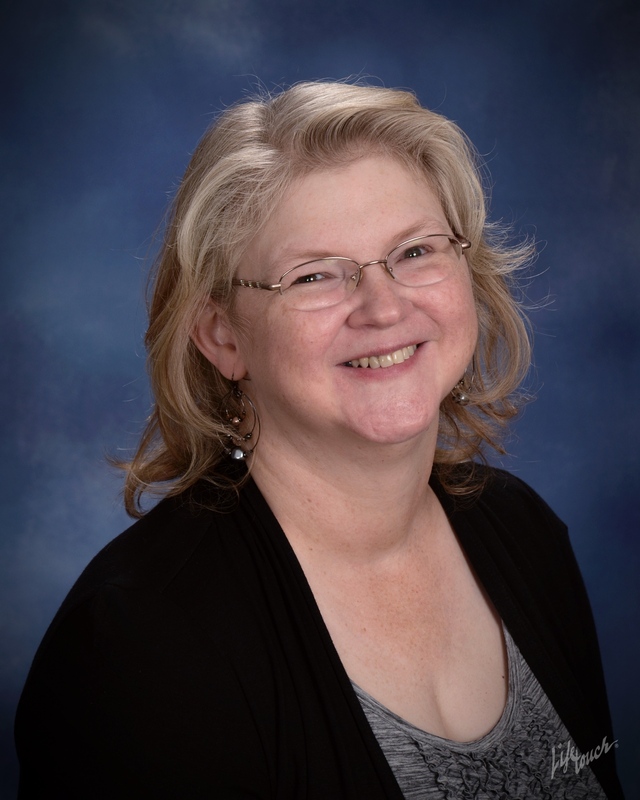 Those two things don’t usually go together – but I earned my high school equivalency and nursing certification while I was living with my aunt. I suppose you’d say I was on my rumspringa then. Actually, I was just following my heart, and soon my heart led me home. I think the most interesting thing about me is that I’m surrounded by a loving family, including my husband, Samuel. 2. What do you do for fun? I love to quilt! I’m not the best quilter in my family—that would be my mamm. I love to do it though, and when I’m not helping Samuel with his patients, cooking, or cleaning then I am quilting. Right now I’m working on a nine patch crib quilt for my brother’s wife, Leah. 3. What do you put off because you dread it? I will admit that I dread going to visit Rachel, Samuel’s sister-in-law. She is a sad, bitter woman and try as I might we’ve yet to become friends. When I’m with her, I’m at a loss for what to say, and when I leave, I wish that I could have thought of some way to brighten the situation. 4. What are you afraid of most in life? I think the natural answer would be death—but after working in the hospital I know that death is a part of life. Perhaps I knew that even before I pursued my nursing certification. Since we are Amish, we believe that each person’s life is complete when they die, that God is all-knowing. Sometimes I think about my father’s accident, and how I wasn’t here to help him. Then I grow afraid that something similar could occur again. When those thoughts plague me, I know that praying is the only thing that will ease my heart. 5. What do you want out of life? To be with my family—all of my family. Samuel and I are expecting a boppli, so this is a very exciting time. What I want more than anything is for our child to be raised in this circle of love that includes my parents, brothers and sisters, and friends. 6. What is the most important thing to you? My faith. I know that without my faith I would be floundering through life. The scripture is what guides me. I’m grateful that I was raised in a house of faith, and that each day brings me a little closer to my Lord. 7. Do you read? If so, what is your favorite type of book to read? I do read—a lot! I read all sorts of things—nursing books and articles, quilting books (even Amish enjoy new patterns), and I also like to read a good fiction book. We visit the small library in our town quite often. 8. If you could change one thing about yourself, what would it be? I’ve been trying to learn to slow down. Now that I’m 23 and expecting a child, I shouldn’t run around like a small child. I’m trying to remember to measure my steps and think before reacting. That’s hard for me, as I become caught up in whatever is occurring and my first reaction is to act—not always the best thing. 9. Do you have a pet? if so, what is it and why that pet? We do not have pets in the traditional sense, though I wouldn’t be surprised if Samuel purchased a hunting dog. He’s been looking at them lately, though he thinks I don’t know that. I suppose our horses are like pets though, as we spend a lot of time caring for them and we depend on them for transportation. My mare’s name is Beni. She is a quarter horse, 14.2 hands high and 6 years old, sorrel colored. 10. If you could travel back in time, where would you go and why? I would go to the night of my father’s accident, when his buggy was hit by a car. I would be with him, to care for him as he lay in the snow. But I can’t go back, and I’m grateful that Gotte used that incident to bring Samuel and me together. Thank you so much, Vannetta! Happy holidays to you and your family!